Currently available computational tools for the prediction of pathogenicity of missense variants mostly rely on analysis of sequence conservation/evolution. Mainly, the relative frequencies of wild-type and mutated amino acids at the given mutation site are evaluated from multiple sequence alignments (MSA) of homologous proteins. While this approach has proven effective, it suffers from usual shortcomings associated with the creation of sufficiently populated and variegated MSAs. Besides, the intuitive correlation between sequence conservation and low tolerance to mutations does not depict the whole scenario: in many cases, variants at non-conserved positions exhibit a complex pattern of functional modifications, stemming from the very fact that the lack of conservation at some sites may be a source of variability allowing for the functional specialization of proteins belonging to the same family. Functional/dysfunctional effects induced by mutations at non-conserved positions often do not correlate with the evolutionary frequencies of the amino acids . In view of these limitations, the need for devising prediction tools that take account of the physical properties of the protein, complementing those implied by evolutionary statistics, became clear. 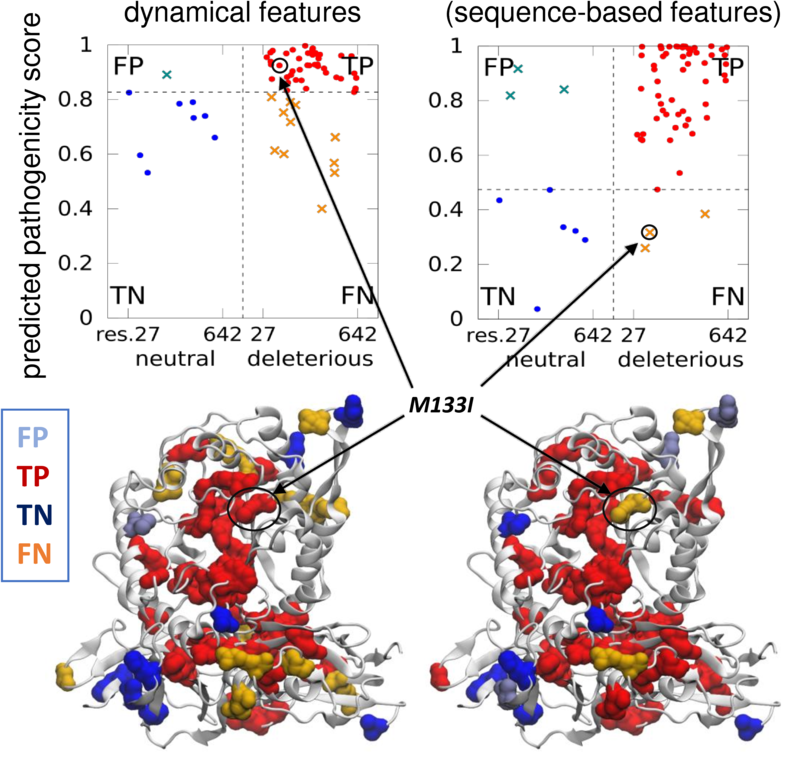 Several studies demonstrated the benefits of considering structural features in the evaluation of the impact of mutations on protein functionality for identifying disease-causing mutations. Among them, PolyPhen-2  is a broadly used tool that showed significant success by including various structural properties as parameters in the evaluation of a variant’s pathogenicity. Yet, there is a need to further improve our ability to discriminate between disease-causing and neutral mutations, given the discrepancy that still exists between predicted and actual consequences of many missense mutations .